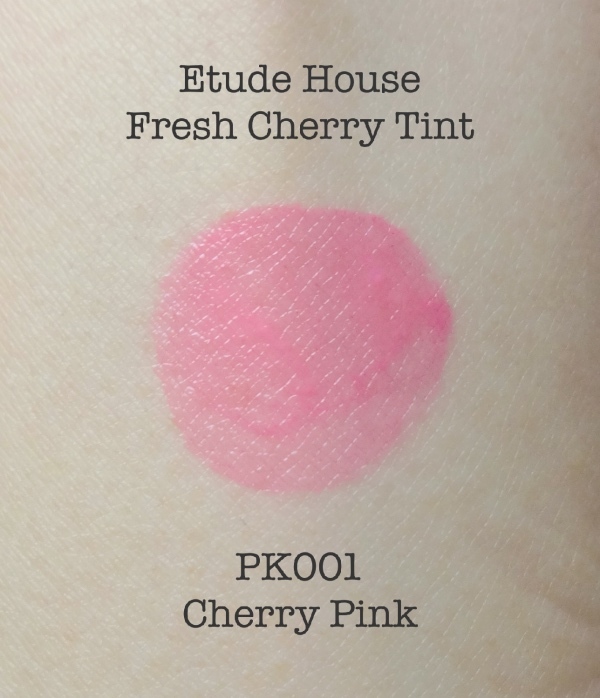 I believe Etude House Fresh Cherry Tint (앵두알 맑은 틴트) has been out for a couple years at least, but I only came across this one about a month ago. I can understand why Fresh Cherry Tint is Etude House's steady-seller, although the merits don't strongly appeal to me (which I will explain further down) that I would go out of my way for more. Cherry Pink (PK001) is a misleading name since it is a light milky pink. I am not complaining because it was a color missing from my lip collection for quite some time (shocking, I know). The tube is pretty and functional. I love the smallish size which is not much bigger than a normal lipstick. Have I seen something this cute from the U.S. drugstore range lately? I don't think so. Fresh Cherry Tint comes with a standard doe foot applicator. The handle is on the short side and convenient to use. I don't appreciate longer ones in general because I like to stand close to my mirror when applying makeup (if you understand). The formula is really well-balanced and comfortable on the lips. 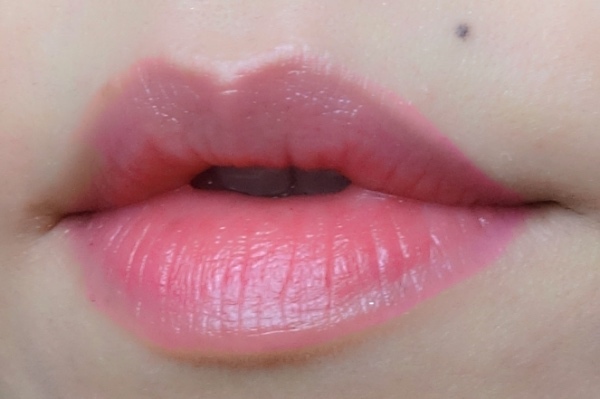 I can see where this tint with creamy texture sits in the vast lip tint market - it is rather perfect for someone who hates dealing with drying runny ones but is afraid of stronger gel types. Fresh Cherry Tint is very easy to apply and to control color intensity. The milky pink color sets into a slightly darker and warmer pink, which looks uber natural on my complexion. It takes a bit longer to completely set, and I would say the staying power is just okay (I suppose the darker colors would stain and last better. This seems to be common regardless of a formulation). For me, I need something more tenacious if I am to choose lip tint over lipstick. 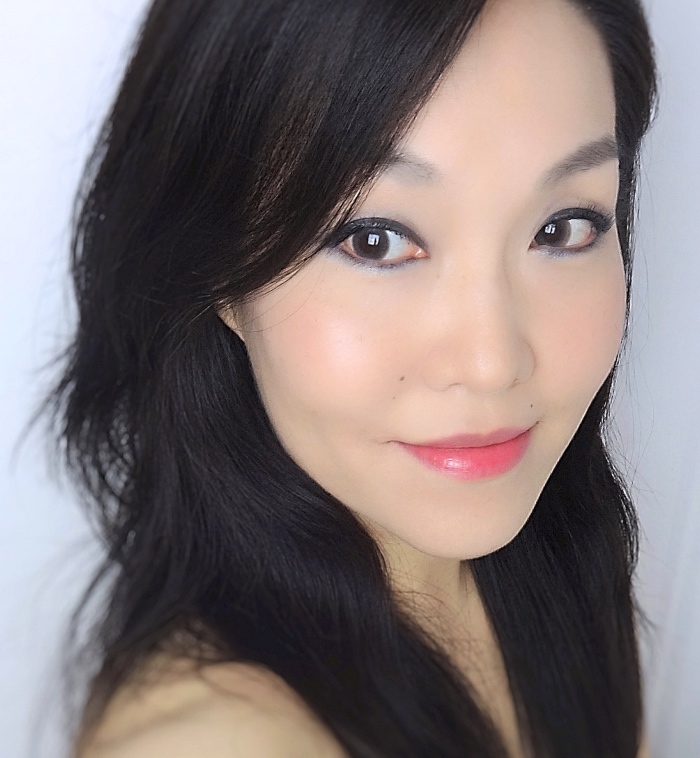 Here is an overall look with Etude House Fresh Cherry Tint in Cherry Pink (PK001). Etude House Fresh Cherry Tint is largely available on eBay ranging $4-7 (from oversea sellers). If you find them too cheap (like under $2), they are most likely lookalikes. It is hard to imagine there is a market for dupes of something this affordable, but it is what it is. Just be aware. There are fake Etude House products? This blows my mind, lol! I still have a stick version that I like, but I didn't like any of the other tradition more watery tints. Sticky and then disappeared, with an odd ring! But they look lovely before then, lol! And this color looks great - I'm missing these kinds of shades, too. It's like, there are fake NYX products here. NYX I think is affordable enough, and there are fakes. And here I thought you had the spectrum of pinks in your collection Lena ;p I wouldn't expect such a soft pink color from something called cherry pink but the softness is very pretty and wearable. I had no idea there are lookalike EH products. It's crazy considering they're pretty affordable to begin with. I thought I did, too! LOL. Actually, this is the kind of pink I used to have many in different formulations. I don't even know what's happened. ;) That EH dupe situation is pretty crazy, right? I would have never guessed! I had one of these in a cherry red shade and it wore like a champ. I need them to make them in shades that aren't super bright though. It doesn't seem like that brown poo lip trend will ever hit Korea. Oh, so guessed it right. Korean lip tints are great in general, but they lack depths and varieties. It seems that they need to put in fuchsia or deep red pigment to make anything long lasting. I still prefer super bright pink over brown poo (LOL), but yeah, I wish there were more interesting shades..